How to Make Cauliflower Rice - A Photo Tutorial from Oh My Veggies! Let’s be clear: cauliflower does not magically turn into rice when you grate it, so don’t expect this to taste like rice. It’s more about function. So if you’re not a big fan of cauliflower to begin with, you probably won’t be a fan of cauliflower rice. To make enough for two big servings, start with one large cauliflower. Pull off the leaves and break the cauliflower into large florets, then rinse them well. Leave them in a colander to let all the moisture drain off or pat them dry with a paper towel. If you plan on steaming your cauliflower rice, it’s not super important that the florets are dry, but if you’re going to sautée, dry it well. At this point, you have two options: you can grate your cauliflower florets or you can process them in a food processor. Obviously, the food processor is the easier choice. Break the florets into smaller pieces, then put half of them in the large bowl of a food processor and pulse until finely chopped, then dump the rice out and pulse the remaining florets. If you don’t have a food processor or you want to make sure your grains are uniform in size, using a box grater (on the side with the larger grates) works well too. Now it’s time to cook your cauliflower rice! (You can eat it raw too.) Heat a large skillet over medium-high heat and swirl around about a tablespoon of oil to coat the bottom (grapeseed oil and olive oil work well). Once the oil has heated, add the rice and cook it for about 5 minutes, or until it’s softened and just beginning to turn golden brown. Season with salt and pepper to taste. 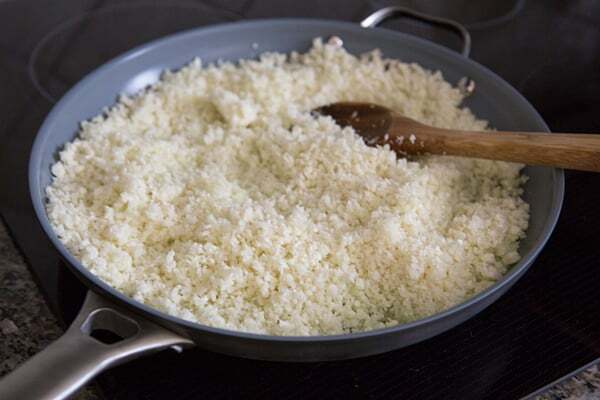 Depending on the plans you have for your cauliflower rice, you can add some chopped onion or minced garlic to the oil before adding the cauliflower, or stir in chopped herbs or fresh lime juice after the rice is done cooking. 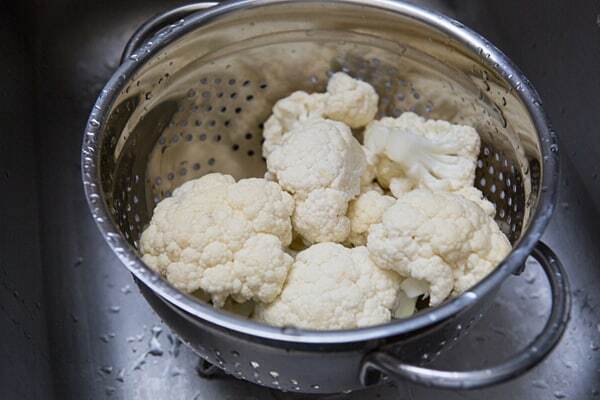 If you prefer to steam your cauliflower rice, you can heat about 2 tablespoons of water or veggie broth in your skillet, add the cauliflower, then cover until tender, about 2 minutes. If there’s still liquid in the pan, take off the lid and let it cook off before serving. This saves you a few calories because you’re not using oil, but I think the sautéed method is best–the cauliflower flavor mellows a bit and it becomes almost nutty, kind of like brown rice. Cauliflower doesn’t work as a substitute for rice in every recipe, but it will work as a substitution in any recipe that calls for serving over a bed of rice. It’s also a perfect replacement for couscous. Half a batch of it cooked in grapeseed oil (pictured above, with red curry vegetables) is only about 40 calories more than a paltry half-cup serving of cooked white rice. That’s a giant plate of rice for 165 calories! Cauliflower isn’t just for rice! You can make cauliflower into a pizza crust, use it instead of chicken in Buffalo wings, and even make it into a creamy alfredo sauce. We’ve got a round-up of 20 secret-ingredient cauliflower recipes with lots of additional ideas. I LOVE cauliflower rice!! I love regular rice too, but I la la la loooooooove cauliflower rice! I can eat the whole skillet…which is kinda gross when you think about it…but it’s so good! Me too. I like MASSIVE AMOUNTS OF FOOD! When I make Asian food at home, I want to feel like I’m at a restaurant and pile huge amounts of rice onto my plate. I agree, raw cauliflower is one of my least favorite raw veggies and is hard to digest for me. In fact, it has always been my husbands least favorite food of all time! However, one time I steamed and then pureed cauliflower and mixed it with fresh herbs to make a mash and my husband ate it up so fast .. I told him what it was a he was SHOCKED! Now, he makes me buy the cauliflower so I can make it for him as a mash haha so I think I’ll try this method with this new head of cauliflower and see what he thinks … I think it will be a hit! Cauliflower is definitely one of those veggies people feel very strongly about. 🙂 And I get it! It’s a little bit funky! But I think good preparation can overcome that. I”m not a rice hater either- but I do love cauliflower rice! Lovely, lovely photos. Thanks! Great post. I have enjoyed cauliflower rice, but rice is my favorite high-carb food so I’m wondering how I would like a mixture of rice and cauliflower rice. May have to try that. Someone commented after you to say that she makes a mix of 1/2 cauliflower rice to 1/2 regular rice. I think I’m going to try it myself! I’ve been touting the love of cauliflower rice for a long time now, especially in a scorching hot wok like ‘fried’ rice with a ton of chopped veggies and all the seasonings. Cauliflower is amazing. It can morph in to so many different dishes. I can’t wait to try cauliflower rice! Any chance you can throw in the recipe for the for the veggies and sauce in the final pic? The entire dish looks fabulous. Oh it’s like cauliflower cous cous! I love this technique. But I am also a cauliflower fiend so it’s not all that surprising. Just recently made cauliflower “rice” in my vitamix using the wet grind method! So easy and such a great base for cold salads. Will try it as fried rice too! Ooh, I’ll have to try it in my Vitamix too! I like cauliflower rice and have been eating lots of cauliflowers lately. I have never tried cauliflower rice! Can’t wait to make this. Cauliflower EVERYTHING is everywhere lately. It’s crazy! I think cauliflower is the new kale. I’ve tried cauliflower rice a few times and love it. It really does remind me more of couscous than rice, though. I like to add cauliflower rice to real rice, too–about 1/2 and 1/2. The cauliflower completely disappears visually and to taste and mouth-feel in white rice, but the benefits are there. 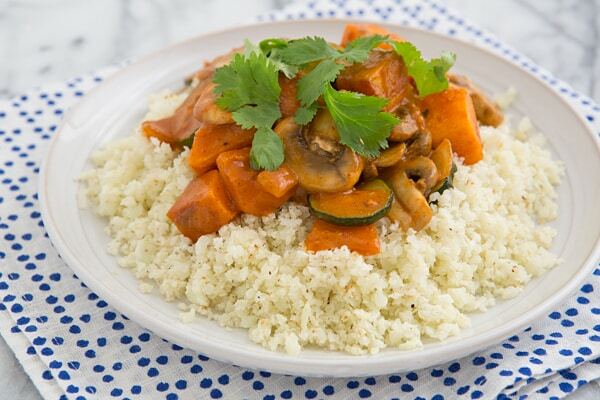 Yes, it’s definitely more of a couscous texture! I like the idea of combining it with regular rice–I’m going to try that! Well, if cauliflower isn’t your favorite vegetable, you might want to stick with rice made from rice. 😉 But if you like roasted cauliflower, you’ll probably like sautéed cauliflower rice–it has the same mellow, mildly nutty flavor. HA! That’s how my mom made cauliflower too. And I didn’t hate it, but I didn’t love it until I discovered that you could make it in different ways. 🙂 Try it roasted too! I’ve never tried this, BUT I believe that it would be great with a sauce over it. I love cooking Chinese but as a diabetic the rice makes my glucose soar! lol.. I hope I like it.. I hope you like it too! It works with just about any sauce you’d use with rice. I totally agree – I love cauliflower rice AND regular rice! I’ll never give up carbs, but I do think cauliflower rice is delicious with certain dishes. In fact, I’m writing a post about it now! Yeah, I’m not a carb-hater at all. 🙂 I think my heart would be broken if I had to give up my precious, precious carbs. I’m totally with you- both “rices” have their purposes. Thanks for the reminder to make cauli rice though as it’s been too long. I make a delicious cauliflower fried rice with lots of goodies in it and serve it with Asian grilled tofu. Yum! I never thought to make fried rice with it, but you’re the second one to mention it–I need to do that! Ooh, I’ve always made my cauliflower rice in the microwave – I can’t wait to try it on the stovetop. With some sautéed onion and garlic, mmm! I made this for dinner tonight, along with stir fry. I’ve been searching for new interesting recipes since one of my children has become vegetarian. It was a HUGE hit with my entire family (even the ones that were hesitant at first). There wasn’t a morsel left to be had! I’ve shared the recipe with countless friends and family too. Thanks for making our dinners yummy and interesting! I just went by what the package in my pantry said! I tried cauliflower rice once, but it was raw and I was really not that into it. OBVIOUSLY I should have cooked! DOH. What was I thinking?! Ha! That’s how I tried it first too and I thought ALL cauliflower rice was raw, so I avoided cauliflower rice like the plague after that. Then I realized it could be cooked too, which is completely different! Neat idea! I’ve never heard of cauliflower rice, but I think rice is a must for curries and those saucy stir-fries. And calorie-counting has taught me that big plates of rice are a no, so I have to try this! Who knew rice had so many calories, right?! It pains me to make a meal with rice and measure out a little half cup for me and Chris gets a big bowl of it. Sad! 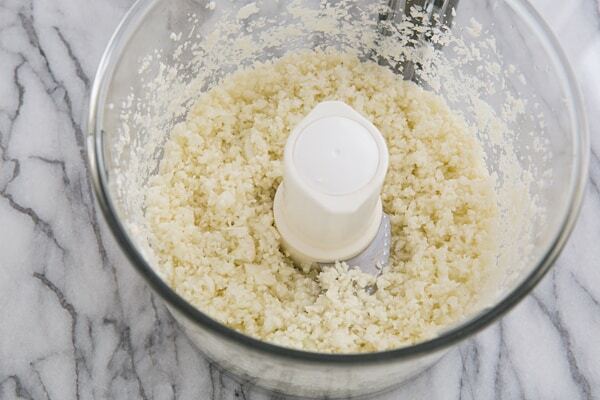 How to make cauliflower rice: make sure your food processor works! I planned to make it this past Sunday with some spinach. Cut up the cauliflower, put it in the food processor, could not for the life of me get the lid shut! I can’t tell if there’s a notch broken or what, so I ended up making cooked cauliflower with spinach instead. Still tasted good though. Now about that food processor… I’ll have to ask the manufacture. Food processors are so fussy! I’ve gone through quite a few before I settled on one that seems to work well. (Knock on wood!) I hope you figure it out. Why not mix the cauliflower rice with the real rice for a more balanced dish? You can definitely do that too! Okay, this looks way WAY easier than I thought it would be. And I love the idea of sauteeing it with a little onion. This is happening SOON. 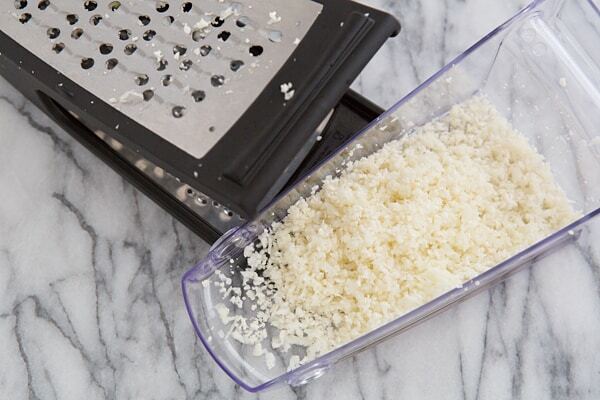 It’s a little bit of a mess if you use a grater, but with the food processor, it’s super simple. You definitely need to try it!